Here's a reason to turn around when looking at the sunrise or sunset. At the far side of the sky might be another fake sunrise (or sunset), made from anticrepuscular rays. Ever stood on a long, straight stretch of highway? Turn one way, and the sides of the road seem to flare out from a central point at the horizon. Turn the other way, and again, the sides of the road flare out from where they converge. We know that this is just the way perspective works. We are standing in a long stretch of road made by two edges that run parallel, and only seem to both converge at the horizon point. Now look at a sunset that is partially covered by clouds. If there are rays of light streaming out, they two seem to be converging at the sun and flaring outwards. These are called crepuscular rays - from the Latin word, "crepusculum," for "twilight." Just like the edges of the road, they're not really streaking outwards. The shafts of light are running parallel to each other across the sky. This means, again like the road, they will seem to converge at the opposite horizon. 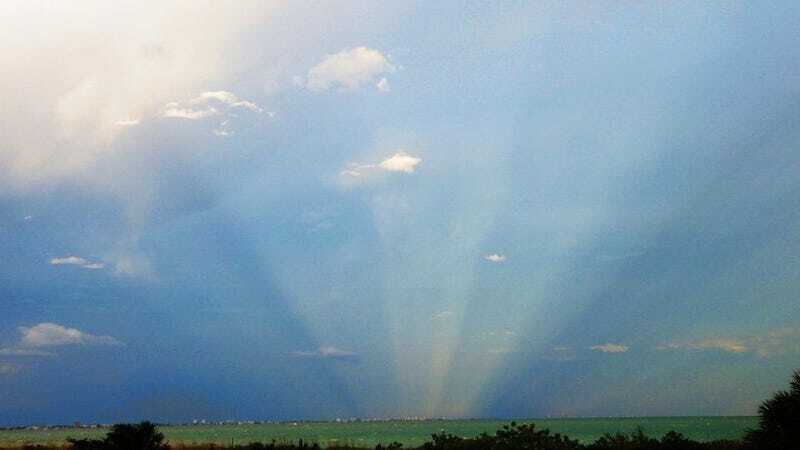 If the conditions are right, you will see these rays, anticrepuscular rays, converge and seem to make a false sunset at the far side of the sky.